Why do crepes feel like such a treat? Why do so many people whip up epic quantities of pancakes on Sunday morning but haven't thought of making crepes? As Jen and I discovered this weekend, it's as easy as making pancakes, healthier, and the opportunities for creative genius in fillings are endless. And it's fun in pretty much the same way making your own pizza is fun. Ham, apple, swiss cheese, and honey crepe. Inspired by my favorite cooking magazine, Everyday Food, we whipped up a half-batch of crepe batter -- enough for four crepes. The key here was pureeing the batter to ensure even blending of the ingredients, and I added a little cinnamon because I like cinnamon. Nutmeg would be interesting too. You should also allow the batter to sit once blended, apparently in order to let bubbles dissipate. 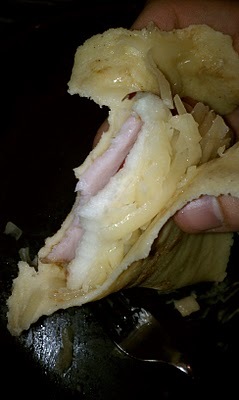 We did a sweet (Nutella and banana; boring but delicious) and a savory/sweet (ham, apple, swiss, and honey). The genesis of the latter came in me wandering Whole Foods, in my own mischievous and hungry little world, as Jen trailed behind making sure I was actually picking the right things off the shelf. She's used to this sort of thing. It's probably a lot like babysitting. I have to say, making the crepes, stuffing them, and baking them was A LOT of fun. I fully intend to host a build-your-own-crepe brunch at my house (takers?) and do a far more in-depth post about crepe-ing at that time, but for now, awesome and easy dinner. Wonderful Website, Carry on the fantastic work. Regards.